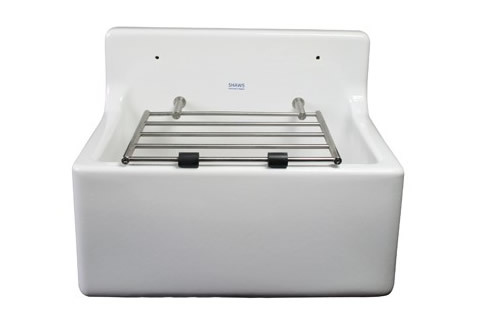 Shaws, who are well known for their superior ranges of fire clay sinks for both commercial and household usage, now launch a wide range of sinks specifically selected for their suitability and durability for use in laundry rooms, utility rooms and garages. There are six heavyweight sinks available with a durable white glaze. The Shaws glaze has recently been independently tested, using the ISO 22196/JIS Z 2801:2000 test method to international standards, and all samples proved to be ‘antibacterial’. Shaws glaze reduced bacterial colonies of E-Coli and MRSA by 99.99% over a 24 hour period and were classified as excellent in this area. All of the Utility range sinks are scratch and impact resistant, impervious to acid, alkali and bleach unlike stainless steel. Our glazes will never become dull over time, like enamel sinks, they will keep their durable sheen for a lifetime. Our laboratory regularly checks clay and glazes to ensure the highest durability standards are upheld. The range includes a Shaker 800 which is large, deep and extremely versatile and adds a touch of elegance to any laundry or utility room. The Longridge is the perfect sink for either kitchen or utility room as it is a stylish combination sink and drainer product. The Ribblesdale is a beautifully crafted sink and is the ideal choice for a practical sink with a traditional look. The obvious choice for use in a laundry room is the practical and compact Belfast, a sink suitable for many styles of homes. Shaws wall-mounted sinks are ideal if you’re looking for an easy to install or space saving sink. It includes a stainless steel bucket grating with rubber pads - and lastly the Pendle. This is a more contemporary version of the Belfast sink and fits in perfectly with a both modern and traditional looking application. Its cleaner lines offer durability but is aesthetically more modern in appearance.